I think everyone is guilty of this one. We meet someone… we know a tiny percent of their character, then we project onto them what we want them to be. Think about it. You meet someone and you click. You think, wow this is my kind of person, they’re just like me. Several weeks or months later you realise they are not who you thought they were. You feel betrayed by them, however it was your own projection that was wrong, not how they presented themselves. I am not talking about con people… just ordinary people. What I am talking about is our tendency to want to think and see the best in people. In reality, you don’t know another person 100% – most of us don’t even know ourselves. So why is that we think we know other people so well – even if we haven’t known them for very long. It’s because we fill in the gaps. We project onto them what we want them to be. Just like a person who is losing their vision to glaucoma won’t realise it because the human brain fills in the blanks – a person fills in the blanks for the people in their life. I can only speak for woman, because I am one… but in the past I have dated people, made all sorts of wild assumptions about their character, desires for their future and views on the world. Only to be horrified down the track that they were nothing like the picture I had painted of them in my head. While it is fun to imagine what someone might be… it’s best to let them reveal who they are in their own time. Don’t assume that they are just like you. Don’t assume that they want the same things in life. Don’t assume that they are a good or bad person. Let them show themselves to you… and when they do, take it on face value and don’t ignore what they are showing you (that’s a whole other issue – ignoring flaws and pretending someone is perfect). 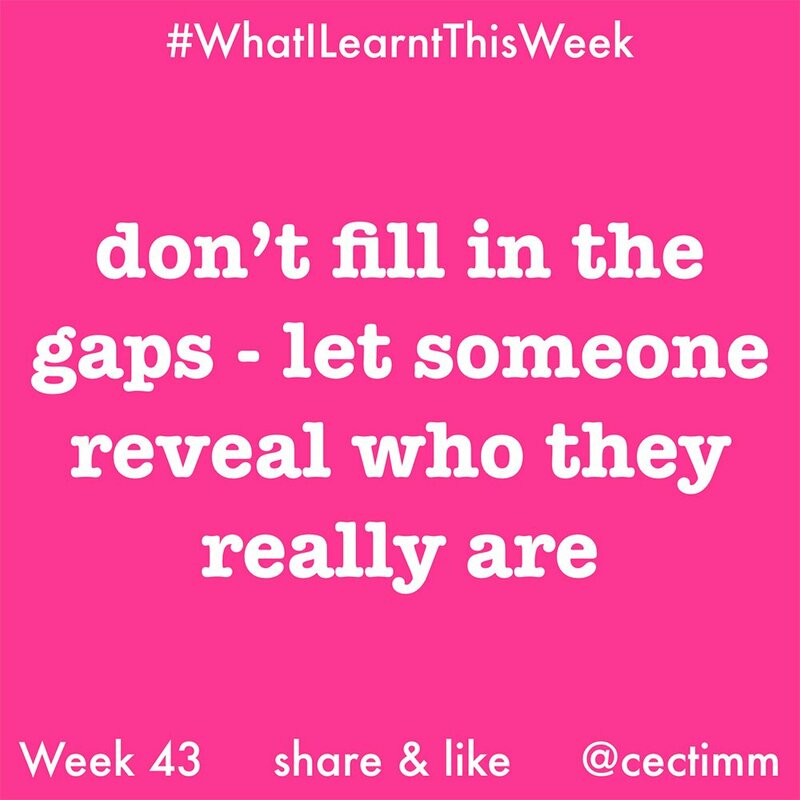 So go out into the world and take people as they present themselves… don’t fill in the gaps.